I love books where a supernatural being has to learn about the supernatural world. Since he or she was not born into the world or didn’t know he or she was part of the world, then he or she questions everything and doesn’t just accept that things are a certain way. That makes for a very interesting book. Heir of Doom is one of those books. Roxanne Fosch has joined The Hunters, where she is being trained physically, as she also learns more about the world she has joined. Or she learns as much as they tell her, since everyone is keeping secrets. Everything is up in the air in this book. Who are Roxanne’s allies and who are her enemies? What are her abilities and why do some people expect her to work wonders? What is the real story of her parents and are they even who she was told they were? Why can’t she shift like everyone else and see what the others of her kind sees? Amongst all of this, there is a missing girl. Roxanne was the last to see her, which is detrimental to someone that no one really trusts. She also has to fulfill a long ago promise and reckon with an enemy that she thought was gone. This plot is jammed packed and I love it. Roxanne is exhausted, but I was always ready for her next adventure. 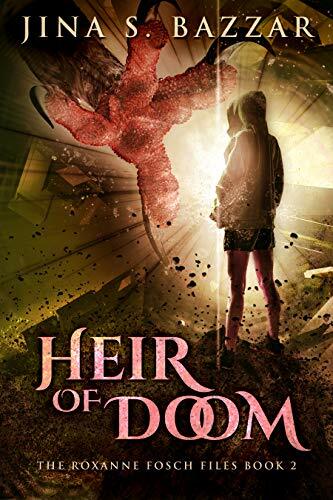 Like Heir of Ashes, Heir of Doom is beautifully written. There are sentences that read like snippets of poetry. There is a nice balance between humorous moments and the drama. I am excited for the next book, which is bound to be as jammed packed with drama and action as this book. I have questions to be answered, but my main one is, where is Vicky, possibly Roxanne’s only friend? I have a feeling about her absence at the end of the book and it is not a good feeling. Either way, I would recommend this book and the previous one, Heir of Ashes. I’m glad you enjoyed Roxanne’s journey through this second installment. Thanks for this lovely review – you made my day! Thank you for writing this amazing book. I can’t wait for the next one.